Homemade Lilac and Lavender Soap…a tute! 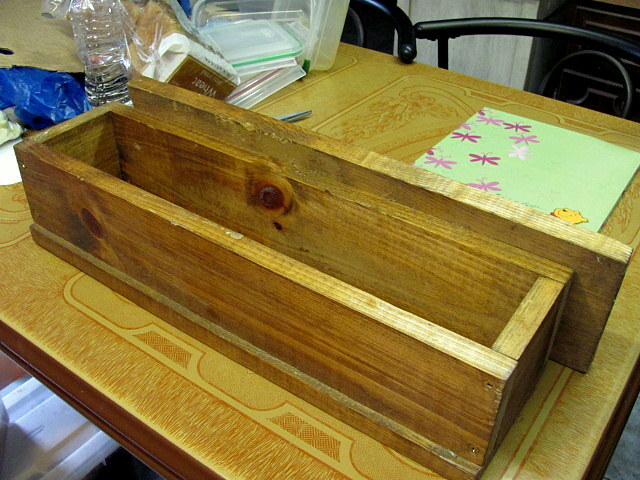 Posted bycubbyholes	 September 2, 2012 September 2, 2012 24 Comments on Homemade Lilac and Lavender Soap…a tute! That day and I made Lilac and Lavender soap. 🙂 A number of you have asked me to put down my recipe and directions for soap making when I made it, so here it is. Warning… this is going to be a very long post because soap is one of those funny projects that is both very simple, but somewhat complicated, too. I want to be sure my directions are clear and concise because I want your soap to come out lovely, but I also want to keep you all safe. So please read ALL directions and ALL warnings/explanations before doing this on your own. I want all my lovely readers to be safe. First the recipe. I’m going to post just two here. One is the most basic white soap you can get and the second one is tweaked a bit to add just a little extra sudsiness and creaminess. 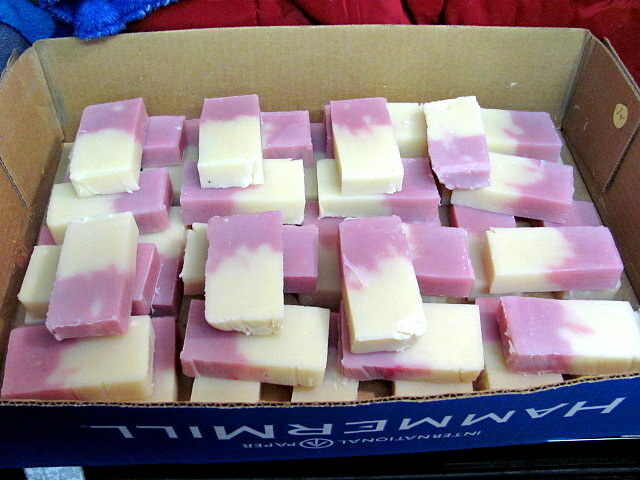 I also use Tallow for my soaps. 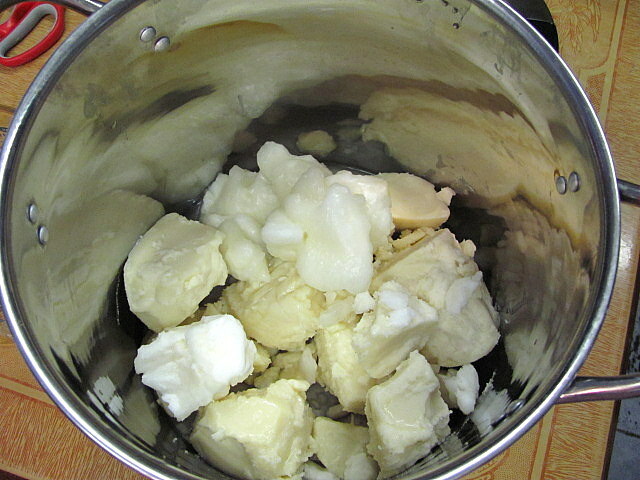 Tallow is rendered beef, sheep and bison fat. Lard is rendered from pigs. Sorry my vegan friends. 🙂 Tallow is very easy for me to get since we have a slaughterhouse nearby and I get it fresh off the cow there. Tallow makes a very hard bar of soap which is the main reason I use it though. The first recipe is tallow and nothing but the tallow. A tallow bar also makes very little in the way of sudsiness or lather. Commercial soaps show you all that fluffy lather and you think, wow that must really get me clean! Wrong! All you are seeing is wasted money swooshing down the drain. Lather does not clean you, the soap itself does. That’s why those bars of soap also don’t last very long. They practically melt under water and again, there goes money down the drain. Tallow bars are the opposite. They lather (the older a tallow bar is the more it will lather), but not nearly as much as you’re used to seeing if you use commercial bars. I must also add here a word about Lye. It is a bit harder to get lye than it used to be due to federal laws prohibiting its sale in public stores several years ago. I think the best place to get it is from http://www.boyercorporation.com/ . They especially work with soap crafters so you can buy it in bulk. I think the smallest amount you can get is the case of 12 2lb. cans. Unless you’re making it commercially to sell, that will last you a LONNNNNNG time. This big batch will make enough soap for sweetie and I to last a year or more. 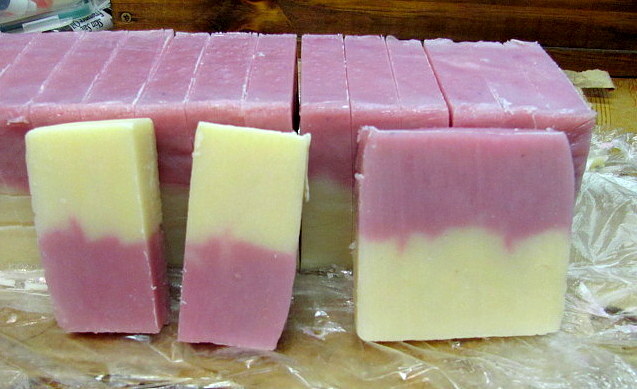 This first recipe is truly the most mild, hard wearing, long lasting soap you can make. It makes approx. 5.5-6 lbs. of soap. Please follow each step in order and READ all directions carefully. Not doing so could potentially cause at the worst, injury; at the least, crappy soap. Gather everything you need first. Once the process is going you won’t be able to run around finding parts. You will need it all at hand. DO NOT USE ALUMINUM ANYTHING. Glass and stainless steel are best. When you mix lye and cold water it causes a chemical reaction and gets VERY hot. Hot enough to melt plastic. (Trust me…I know). I prefer lining it with “Press and Seal” from Glad. It works really well. It’s a little sticky on one side so you can really form fit it to the box. I had to also add some saran wrap today up the sides because I ran out of the Press and Seal. NOTE: The liner is just to help me get it out of my box. If you’re using something plastic or silicone, you can skip this step since you can bend those enough to pop the hardened soap out. NOTE: Whatever container you end up using, you will need some kind of a lid for it. Cut up cardboard boxes can be a lid even. 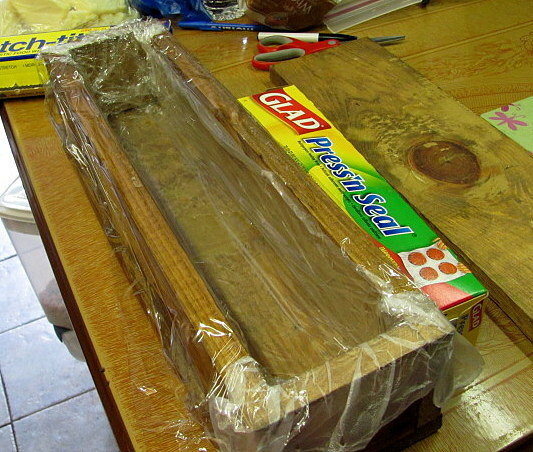 Styrofoam core board, wood, anything so long as your soap is completely covered. Since you’ll need to wrap your soap up completely once you pour it in, you’ll need a lid that covers the top of it totally. Once you have your container all set, it’s time to move on to your fats. 2. Be sure to weigh out all your fats carefully. Soap is not like a stew where you can fudge a little here and there. Nope, it’s a chemical process and as in any lab, the ingredients need to be weighed/measured carefully. Also, with the method I’m going to give here, it helps if your fats are at least room temperature and broken into small chunks. It makes it a lot easier to get them melted down. Put all your hard fats (the tallow and coconut oil) into a large stainless steel (or glass) pot. (I use a cheap SS stew pot. It’s tall so I don’t have to worry about splashing). Honestly, these chunks are too big, but they were very soft since I had them sitting out and its hot today. Clearly mark any items you use SOAP or POISON, whatever you want so that you never use those items for good ever again. I keep all my soap making things in a separate tote. MIX THE LYE/WATER IN A WELL VENTILATED AREA. The fumes, like the lye itself, is caustic. USE RUBBER GLOVES AND MASK FOR THIS PART. DO NOT stir with a wooden spoon. The Lye will sort of…eat… the wood and leave little bits of wood floating in your lye mix. SS spoon or those really heavy plastic ones (the really hard thick plastic stuff) will work. Just don’t leave it in there longer than it takes to stir it enough to dissolve the lye and it’ll be fine. You will need (for this particular method you need less items) a large stainless steel bowl (it will need to have enough room for the 32 oz. of water and room to add the 12 oz. lye to it). I prefer something with extra room so that I have less worry about splashing, but stir very carefully anyway. 2. Measure out your COLD water and slowly add the lye to the water, stirring gently till the lye is dissolved completely. NEVER ADD COLD WATER TO THE LYE. (it makes a real mess and could be dangerous). You’ll notice it will get very hot, very fast. It shoots to over 200 degrees almost immediately so don’t be touching your container. 3. At this point you have fats in a pot and a hot liquid lye mixture. Now CAREFULLY, I mean really CAREFULLY and slowly pour the hot lye liquid into the pot with the fats. Start stirring and keep stirring. The fats will melt due to the very hot lye/water. This is what I meant about not having time to go running around looking for things. KEEP stirring. I wear a mask while I do this at least until most of the fat is melted. I usually use a stick blender for this part, but alas, after my last kitchen rearranging day, I can’t find it. So I’m using a steel whisk instead. It worked just fine. This picture is right after I poured in the lye and you can see how much has melted already. 4. When all the hard fats are melted, pour in the liquid fats. (the olive oil). At this point your soap is starting to get a pretty creamy look. When you add the liquid fat, this is also the time to add other things like colorants, EO (essential oils), anything else you want in it like honey, pulverized oatmeal, etc. I put in my Lilac/Lavender EO a friend made for me. Now stir until you get to “trace”. Pick up your spoon/stick blender (whatever you’re using to stir it with). If it leaves a little “trace” behind, you’re there. Some people describe the “trace” as a little mound of soap that takes a second or two to disappear back into the mix. 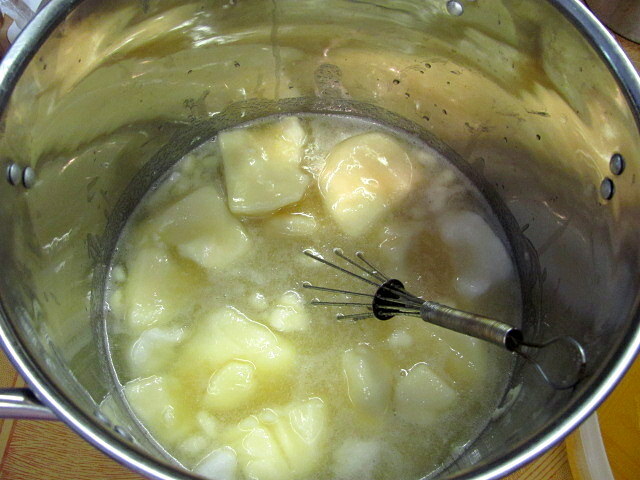 The soap does not have to be really thick just yet, it just needs to be well mixed with no streaks of remaining oil. 5. Now its time to pour into your mold. I poured 75% of my soap into my mold. Then I added some colorant to what remained, mixed it good then poured it on top of the already setting up white that was already in my box. I then swirled a knife around in it to give the bars a swirly mix effect. You will also notice that your soap is a yellowy creamy color. That’s ok. It will lighten as it cures and hardens. 🙂 My soaps are not “bright white” anyway because I don’t bleach them. I render my own tallow and it comes out a pretty creamy light yellow naturally. 6. Put your cover over your soap and bundle it up good in your blankets. You can’t overblanket soap. And you’ll be surprised at how much heat it puts out. You’ll be able to feel it through your blankets. DON’T PEEK FOR AT LEAST 2 HOURS, BUT LONGER IS BETTER. This is the hardest part for me. I love to look at it and see how its turning out. lol. Let the soap sit for 12-72 hours. You can test this if you want by inserting a thin knife into it. If it goes in and out smoothly and comes out clean you can usually take it out of your container and cut it into bars. If it comes out gooey then leave it longer. Carefully cut your bars (again with something you won’t use with food again). Stack the bars in a pyramid shape so that they get air circulation around them. You’ll need to rotate them in the pyramids so that all bars get good air around them. 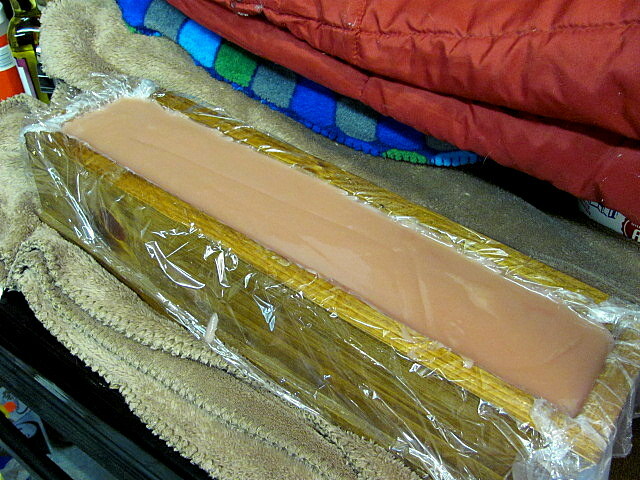 THIS SOAP NEEDS TO AGE FOR 3 – 4 WEEKS BEFORE BEING USED. Remember the part about it being a chemical process? Well that process continues even while they are sitting and aging. 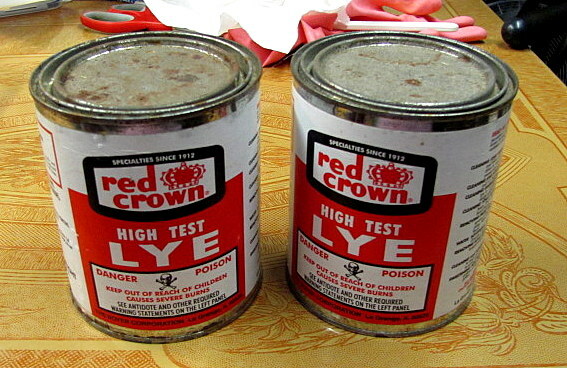 if you use them too soon, the lye is too “fresh” and it can irritate your skin. It’s kind of what happens when you use fresh horse manure on your little plants…it burns them. Fresh lye is the same way. Some folks say after 2 weeks you can use them. I prefer 3-4 weeks. I wait until the next day to wash my utensils/bowls/pot. It is essentially soap by then and easier to wash. So here it is 3:30 am and I just unboxed my soap and cut it. It probably could have waited until morning but I was impatient. 🙂 I really wanted to see how it came out. 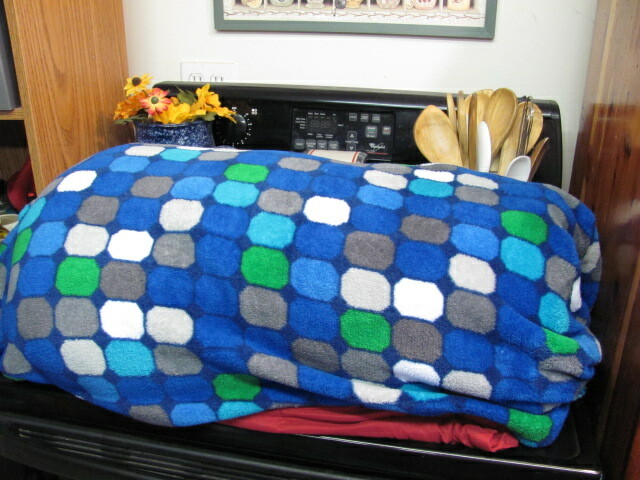 It’s a little softer and hotter than when I usually take it out so I stacked it and then recovered it with quilts again. But here is the unveiling! Pretty loaf, isn’t it? Smells great, too. The color came out nice. I was worried about that. It looks better now than it did in the bowl that’s for sure. This block is more square than usual. I did play with the hard oils a little (I’ve been doing it a while now and knew how much I could 😉 ). The slices were way too square and big so I cut each one in half. That makes them just a little small, but at least they will fit in the hand nicely. Tried for a little bit more swirl, but the box was really full and I didn’t want to take the chance on splashing it and wasting some of it. I still like how it came out, though. And here it is all stacked. I got 44 bars of soap from this batch. That’s gonna last a long time. With the smaller bars I’ll probably use 3 a month at the most. That’s just under a full 15 months of soap made today. I’ll be making more for some Christmas pressies, but not bad for a day’s work. My very first blogging award!!! Some say you can use it after 4 weeks. I prefer it to cure 5-6 weeks. The other wonderful thing about it is that the older it is the more it lathers. 🙂 Just don’t expect it to lather up like store brands. All that foam is just money down the drain as its the soap that cleans not the foamy lather. How do you make The Lavender & lilac oil for the soap? Is this soap good for sensitive ‘& problem skin? I buy the from puritan’s pride. It’s important to get a good food safe organic oil. You can make your own if you have lavender by making an oil infusion. it won’t be as strong a smell and I don’t think I’d recommend it for soap. As for problem skin lavender is very mild but there is no way to tell without trying it if your skin is sensitive to it or not. if you try a test patch on your skin be sure to dilute the lavender oil or any essential oil with another oil. never use any essential oil straight from the bottle or ingest it no matter what some sites might say. hope this helps. Thanks for visiting! I’m thankful it did, many thanks. I love visitors! Sorry it took so long to get back to you, things have been crazy here. Visit anytime and thanks for coming by! Glad this tute helped. I love making soap. I love people visiting. Come by any time!! I’m glad it helped. Please feel free to comment about any of my posts. Thanks! It cleanses the physique and makes the dieter feel healthier. Isn’t that a beautiful soap?! I’ve not yet made any with colorants but I can see why you had to ‘peek’ at your soap log. I’m like you with the size of my soaps — I prefer smaller bars that fits in the palm of my hand. I’ve had some homemade soaps given to me and they were much too large to hold (and too hard to cut down). These are pretty slim bars. They fit easily into my hands, which are smallish, too. Woohoo! Glad you found it. I was just getting ready to send you a link on the other comment. lol. Good timing, eh? You should try it. It’s a lot of fun. Do bear in mind that this method is one not many know about and much different from the way you usually see it done. It’s WAY easier and I have had not a single batch get funky, ashy, or anything since doing it this way. Im loving the sound of this recipe and I am so excited to try it! I just have one question, I have tons of lilac growing in my back yard and i think it would look so pretty if I added some actual lilac flowers to my soap but how should I add flowers to my soap? should I just wait till the last step and add them? wont the lye make the petals lose their pretty color or smell? I have tons of small roses and other flowers in my garden that would make the soap prettier I just don’t know how/when/if to add them. Any suggestions? I’m not a fan of adding flowers to my soaps for decoration because they will turn brown and yucky looking with time. There are a few times I’ll use something in the soap, like chamomile flowers or teas with interesting looks, but I grind them up fairly fine first. That said you can make an infusion, a tea, with your flowers and use that with the lye instead of plain water. Thanks for reading! Wow! That is some expert soap making. Is there a smaller form of this recipe? I’ve never made soap and would like to start small.